Cook your pasta as directed, typically 7 minutes for 1 lb of ww spaghetti. Use plenty of water to keep it from becoming too starchy, ideally a large pasta pot filled almost to the top. Mix in 2 tablespoons peanut oil. In a medium bowl, whisk together 4 tablespoons peanut oil, 8 tablespoons peanut butter, 8 tablespoons soy sauce, 4 teaspoons sesame oil and 4 tablespoons brown sugar. 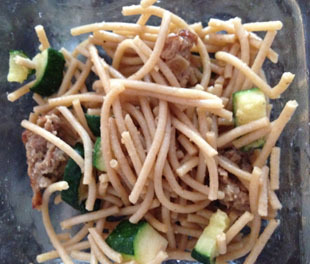 Offer your kids a choice of ingredients — I offer pasta, sauce, zucchini, peanuts and sesames.